Studies of amplification and/or overexpression of c-myc, HER-2/neu, and H-ras in breast cancer have shown that each is associated with a poor prognosis. 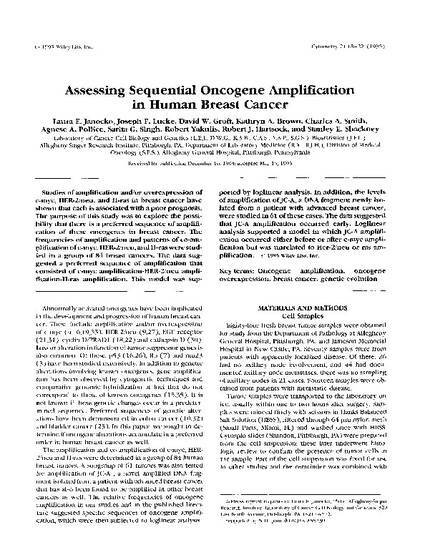 The purpose of this study was to explore the possibility that there is a preferred sequence of amplification of these oncogenes in breast cancer. The frequencies of amplification and patterns of co-amplification of c-myc, HER-2/neu, and H-ras were studied in a group of 84 breast cancers. The data suggested a preferred sequence of amplification that consisted of c-myc amplification-HER-2/neu amplification-H-ras amplification. This model was supported by loglinear analysis. In addition, the levels of amplification of JC-A, a DNA fragment newly isolated from a patient with advanced breast cancer, were studied in 61 of these cases. The data suggested that JC-A amplification occurred early. Loglinear analysis supported a model in which JC-A amplification occurred either before or after c-myc amplification	but was unrelated to Her-2/neu or ras amplification.